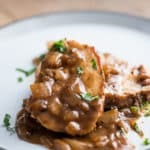 This delicious pork roast recipe with caramelized onion gravy is perfect for Sunday Supper! For that reason alone, it’s worth making it to share with friends and family. Here’s our complete list of all our popular–> pork recipes. How to Cook Pork Roast in the Oven? First of all, we have to say that we love our pork roasts. Second of all, we have so many great pork roast recipes for you guys. Our technique on how to cook pork roast is the full recipe below. 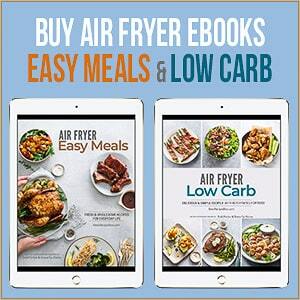 In a few simple steps, you have a delicious pork roast dinner. From our simple oven roast pork recipe, to an instant pot version, there’s so many possibilities for this great cut of meat. 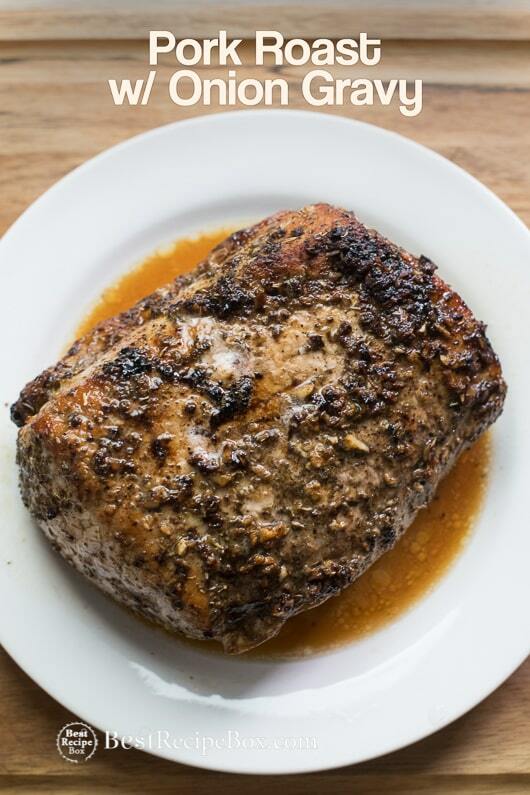 This version is our popular herb pork roast with a new caramelized onion gravy. It’s wicked delicious and you’re a gravy lover, you’ll obsess over this caramelized onion gravy. Everything about this is quick, simple and utterly delicious. The pork roast is juicy and tender because the caramelized gravy is rich, flavorful and perfect with the slices of pork roast. As a result, it’s not hard to to eat a double serving, especially if you add a side of roast potatoes or even a baked potato. 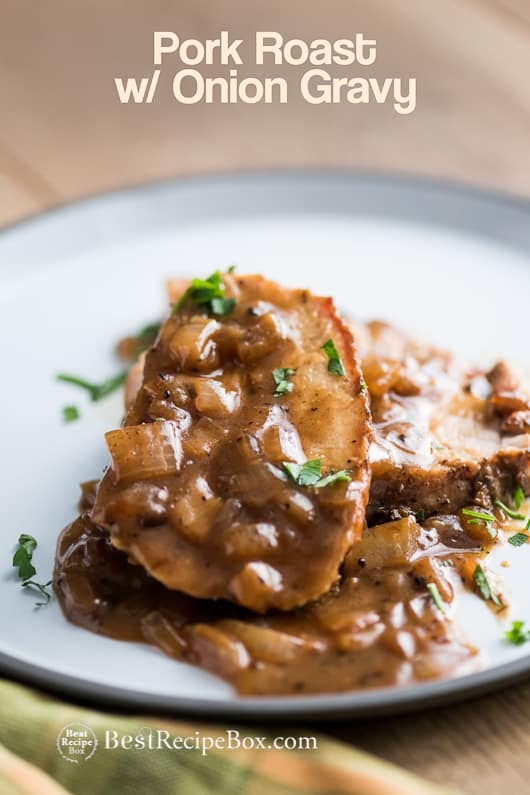 Just lather the caramelized onion gravy over the baked potato and you have a wonderful meal that’s quick and easy for those busy weeknights. Finally, this is a great roast pork recipe to make for Sunday Supper or for a great dinner occasion when everyone is craving pork tenderloin. 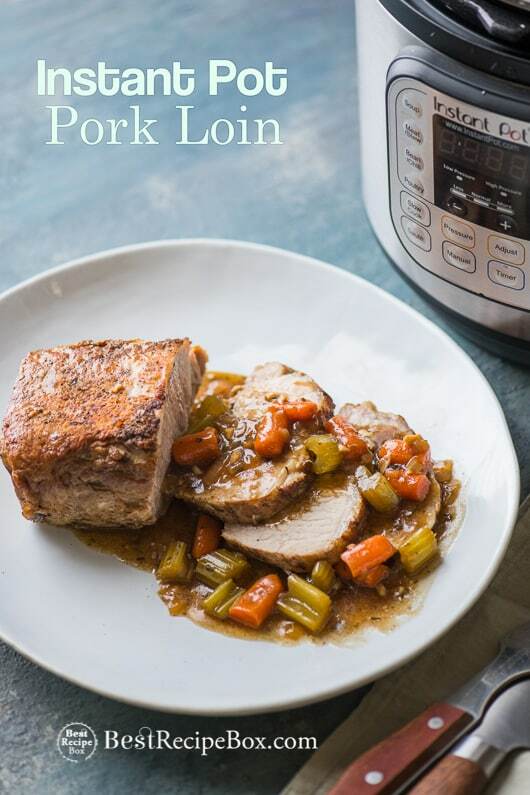 Click Here for more of our Pork Recipes and Instant Pot Recipes and Slow Cooker Recipes. And here’s a great Asian Pulled Pork Recipe Here. Pork loins can also vary in size and thickness. So cooking times will vary greatly, particularly if you bought the tenderloin, which cooks much faster. Cook the loin roast or pork tenderloin longer if it's large or thick. If you are unsure on how long to cook your particular roast, cook the pork loin until it reaches an internal temperature of 140°F in its thickest part. As it rests it will still continue to cook and should reach an ideal internal temperature of 145°F. The higher the temperature, the drier the loin will be, so don't go past 140°F while in the oven too much if possible. Preheat oven to 350°F. Rinse and pat dry pork tenderloin, and then season with salt and pepper. MAKE THE PORK LOIN: Heat a large oven-safe skillet on medium-high heat. Add oil and then sear the pork loin on all sides until a crust forms, about 1 minute per side. Remove pork loin from the pan and set it aside. Turn off heat and remove pan from the heat. In same hot pan add butter, garlic, Worcestershire sauce, and mustard. Stir the sauce until the butter is completely melted. 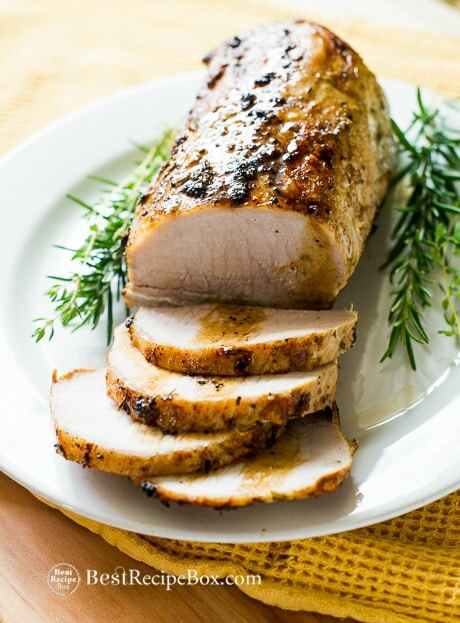 Coat the pork tenderloin with dried herbs by patting it onto the loin. Place the pork loin back in the skillet and spoon some sauce over the pork loin. 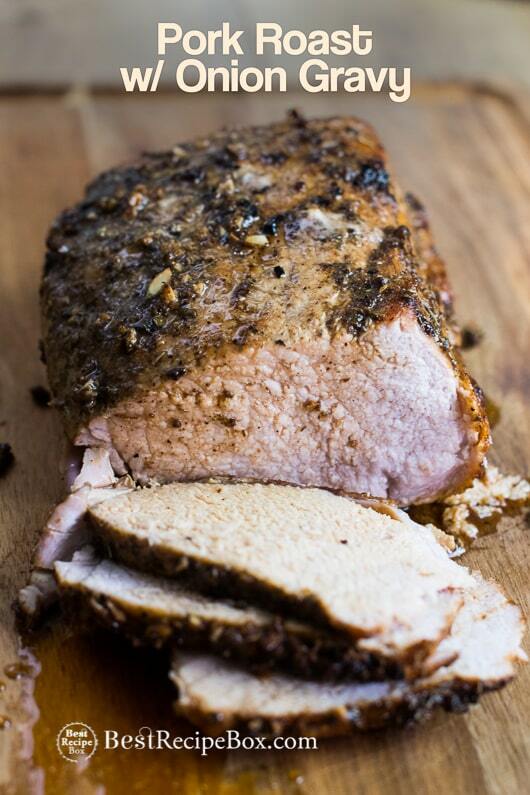 Cover the pork tenderloin with foil and roast for 30 minutes. Remove foil, spoon some more sauce over the loin and cook for about another 30 minutes or until the loin interior temperature reaches about 140°F. Remove cooked pork loin skillet from oven. Remove the pork loin from the skillet and cover the pork with foil to let it rest for about 15 minutes (make the gravy while the pork is resting). MAKE THE GRAVY: Heat the same skillet with the pork drippings on medium-high heat. Skim off any crust chunks in the drippings. Add onions and cook until golden and caramelized, about 5 minutes. Whisk in the flour, whisking to remove lumps. Gradually whisk in the broth until incorporated and well combined. Season with salt and pepper, to taste (the saltiness and flavors will concentrate some when it reduces down). Reduce heat to medium, stirring often, simmer until thickened, about 5 minutes depending on your preferred thickness. Check for seasoning and salt again if needed. 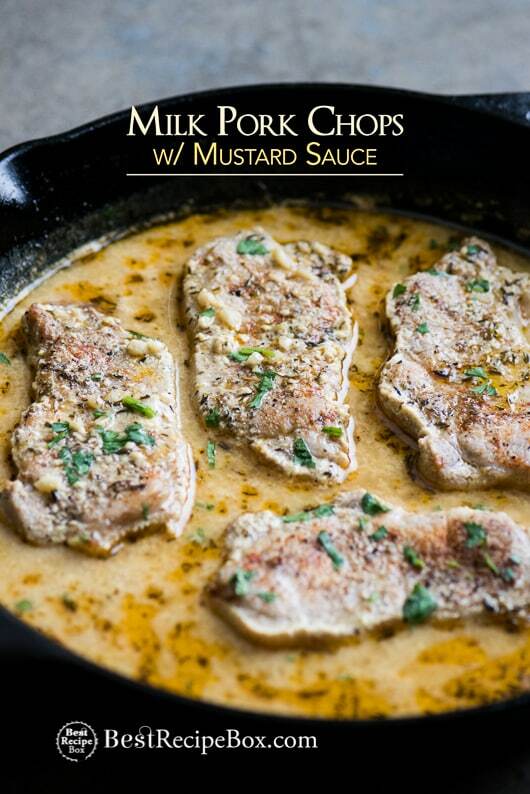 Slice pork loin and serve hot with the onion gravy. 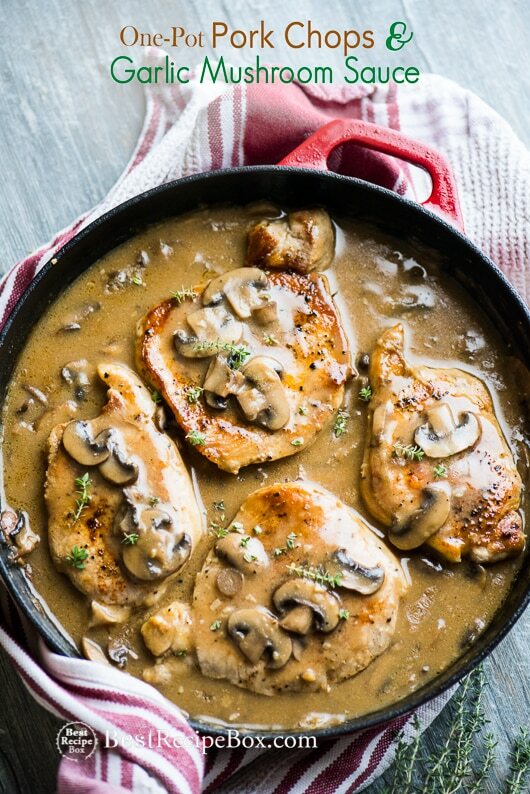 Recipe Note: If you don't have an oven-safe skillet, the pork loin can be seared on the stovetop on whatever skillet you do have, and then finished in an oven-safe baking dish. It just leaves you with another dish to wash.
Carmelized those onions an extra 10 minutes or more and it was great! Thanks for a fantastic recipe. Thanks Johnny! We’re obsessed with the onion gravy too! YUM. Followed recipe and that was a delicious meal. Thanks for sharing. Thanks Michael for letting us know. We’re happy you enjoyed the recipe! Absolutely amazing! So tender and juicy! Best Gravy I’ve ever made! Hubby AND the kiddos cleared their plates, too. Thank you for sharing!! Hi Aubrey, that’s so awesome that your whole family love it, especially the kids! Another great kid friendly meal! Hi…. I am not an experienced cook so I would like to know how the roasted pork loin with onion gravy recipe can be adapted for a crockpot. Thanks so much. 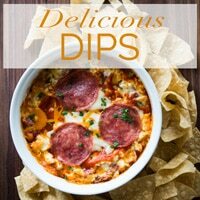 We just got done with Sunday dinner and this recipe rocks the house! Hubby is a heart patient so I cut back the butter to 2 Tbsp and subbed olive oil, but the gravy turned out awesome. 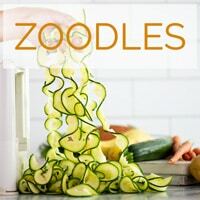 Thank you for the recipe love! Hi Alysia! Thanks for sharing your results and so glad you enjoyed the recipe! 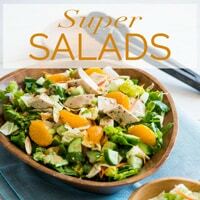 Made this the other night and it was great, although I had to make a slight change — we were out of Worcestershire so I substituted tamari soy sauce, it it worked well (Worcestershire can be rather dominant in some dishes, soy not so much). At the end I decided the sauce was a bit thick and added about ¼ cup of Sherry, which kicked up the flavor a notch. The next time I make this I may add mushrooms and maybe some carrots. Very veritas dish! Sounds great. Love the how you made it to your own style. Hi! We do not re-cover with foil during the 2nd-30 minutes. But it does get covered in foil during the resting period in step 6. I was looking to do something with the pork loin roast that I bought on sale . So happy I found this recipe ! The pork came out moist and the gravy was delicious. 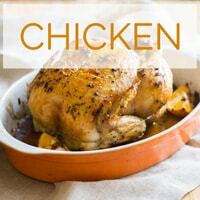 My family loved it and I loved that it was a one pan wonder that was simple to make . It’s a keeper , impressive enough for company . Thanks ! The pork roast turned out perfectly. I had never done pork loin roast before and was nervous but it was delicious, from the mustard sauce to the onion gravy. I added Brussels sprouts, a potato, carrots and celery in the second half hour to accompany it. Thanks for sharing! Thank you Sara for trusting our recipe! We are so happy that you enjoyed it. 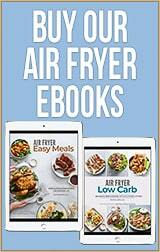 Check out our other pork recipes too. Enjoy! 4.9. The pork loin was delicious. The herb seasoning and searing the meat made it pop. Thank you so much for the juicy recipe! Made this tonight – both 6 year olds at the table LOVED it as much as the adults! Probably adding to my Easter meal lineup…it was that great. 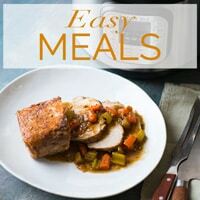 I cut a four pound loin into two 2 pound pieces and doubled the recipe – it turned out just fine and I really didn’t even need to adjust cooking time. Also, the sauce was so great I forgot to make the onion gravy! We will have the gravy at Easter for sure! So happy that your kids loved the dish. And that it’s going to be on your Easter menu. Thank you! Perfect pork. Onions are sweet so adding some red papers might be nice next time. Thanks for making the recipe Phil and so awesome that you enjoyed it. Love the red peppers idea! This turned out fantastically good!!! Everyone wanted seconds. I’ll be doubling this next time! Yum!